Getting noticed with outdoor accent lighting is a subtle way to grab the attention of your guests, making them feel at home even outside. Wether it be your backyard or courtyard, you can rest assured that accent lighting will make you and your guests feel that emotional connection to your landscape. Accent lighting is a way to draw attention and guide your guests into an outdoor space by putting emphasis on the surrounding area through lighting. Think of it as though your designing a new look and you control exactly what you want others to focus their attention on. You don't ever want to over do it since too much accent lighting will take away from your desired look. Find a focal point and use that as a starting point. Any focal point will do as long as it fits the overall look you want to achieve. For example, a fountain is an extravagant focal point, a backyard pool is another great focal point. If you don't have a fancy fountain or a pool, you may decide to use your favorite statue or whatever special feature you have out there. If you don't have a special feature the good news is, you can buy one and it doesn't have to cost that much. Just make sure its something that you love and that fits your outdoor environment. The point is that you decide what you want that focal point to be. Foot traffic will often follow the path that is lit up. This simple tip gives you control on deciding where you want your traffic to flow. You can then design a plan to direct your traffic through outdoor path lighting or guide your traffic by using subtle supporting reference points (AKA Focal Points) around your landscape. Whenever you decide how you want your traffic to flow don't over do it. Remember, you want to keep your focal point the main attraction and not take away from it's glory. The focal point should be supported by secondary or supporting lighting that will invite people into your outdoor space. Accentuating the surrounding landscape can make your outdoor space seem larger. These supporting features will give guests a welcome feeling and make them want to follow the path of light you've laid out for them. Making your supporting lighting flow is of utmost importance. You always want it to lead your guests, therefore random spots of light surrounded by darkness will often confuse your guests. 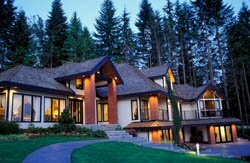 By allowing the light to flow, your are actually accentuating various parts of your outdoors through outdoor recessed lighting, uplighting, downlighting, or moon lighting often created through outdoor tree lighting techniques. Outdoor accent lighting fixtures come in a variety of different shapes and sizes. Your choice will depend on what effect you are looking to create. A clean look is usually desired since you'll want to draw attention to the focal point, not the fixture. That is why outdoor recessed lighting is a big favorite. If recessed lighting is just not an option, you may want to try surface mounted outdoor lighting fixtures. Because these fixtures are exposed and not hidden, it's best to choose a color that helps blend your fixture into it's surrounding environment. If you can't avoid it and you're fixture is going to be seen in plain view, its best you choose a fixture that goes along with the common outdoor theme. For example, you may be using accent lighting on a modern home. Your best bet is to find a modern outdoor lighting fixture that works well with the modern architectural style you're already working with. Choosing quality outdoor accent lighting fixtures is always recommended since they must perform well under stressful conditions. A little extra money spent now will save you time and headaches later on.